Our City officials are attempting to shut down the ministry efforts of Street Church by getting an injunction on the church’s activities. 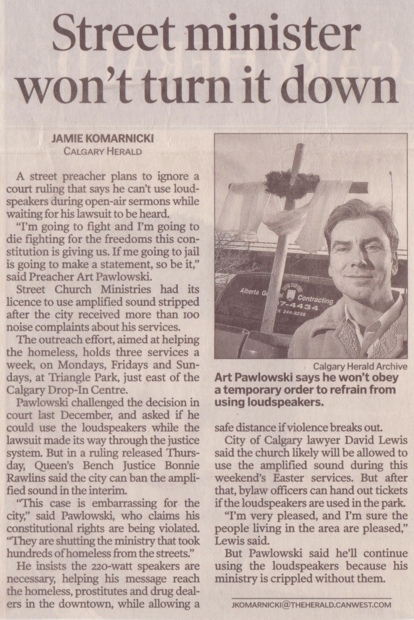 This would mean that Street Church would be either forced to stop helping the poor and preaching the good news of the Gospel or its leaders could face jail time. Street Church is committed to forwarding the Gospel regardless of the costs. 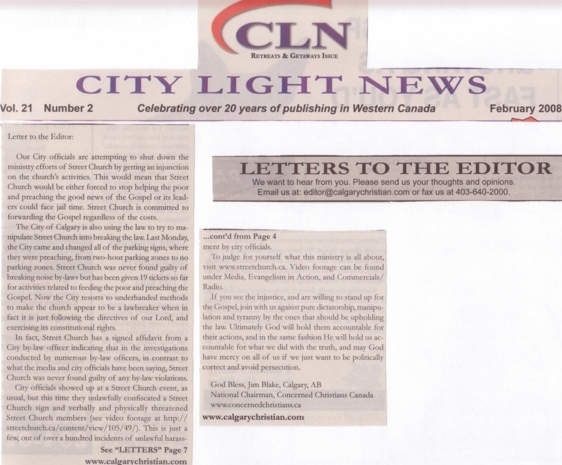 The City of Calgary is also using the law to try to manipulate Street Church into breaking the law; Last Monday, the City came and changed all of the parking signs, where they were preaching, from two-hour parking zones to no parking zones. Street Church was never found guilty of breaking noise by-laws but has been given 19 tickets so far for activities related to feeding the poor and preaching the Gospel. Now the City resorts to underhanded methods to make the church appear to be a lawbreaker when in fact it is just following the directives of our Lord, and exercising its constitutional rights. 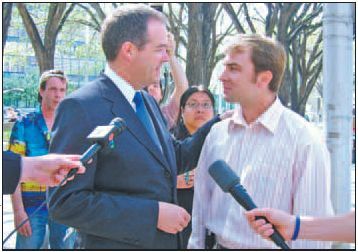 In fact, Street Church has a signed affidavit from a City by-law officer indicating that in the investigations conducted by numerous by-law officers, in contrast to what the media and city officials have been saying, Street Church was never found guilty of any by-law violations. City officials showed up at a Street Church event, as usual, but this time they unlawfully confiscated a Street Church sign and verbally and physically threatened Street Church members (see video footage at http:/ / streetchurch.ca/content/view/10S/49/). This is just a few, out of over a hundred incidents of unlawful harassment by city officials. To judge for yourself what this ministry is all about, visit www.streetchurch.ca. Video footage can be found under Media, Evangelism in Action, and Commercials/ Radio. H you see the injustice, and are willing to stand up for the Gospel, join with us against pure dictatorship, manipulation and tyranny by the ones that should be upholding the law. Ultimately God will hold them accountable for their actions, and in the same fashion He will hold us accountable for what we did with the truth, and may God have mercy on all of us if we just want to be politically correct and avoid persecution.